Teamoy Travel Jewelry Organizer Case, Storage Bag Holder for Necklace, Earrings, Rings, Watch and More, High Capacity and Compact,Black by Teamoy at KOPA. MPN: TY05501. Hurry! Limited time offer. Offer valid only while supplies last. HIGH CAPACITY: Roomy enough to carry what you need for on-the-go, Keep all in one place and neatly organized. Easy access to what you want when dressing. No tangle, no loss, no damage. SMART DESIGN: Special zones for your jewelries are great to keep them separated and avoid colliding and tangling with each other and damage. The detachable divider in the second section allows you to customize the layout for various need. WELL PROTECTION: This jewelry holder is made of durable and sturdy material, beautiful craftsmanship. well-padded semi-flexible cushion offer excellent protection for your jewelries and accessories from scratches. 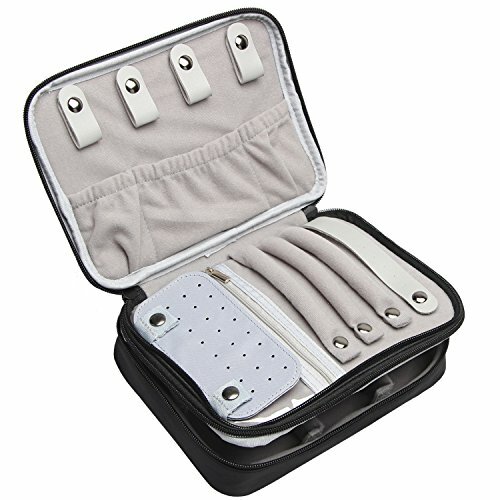 EASY TO CARRY: Lightweight, trendy and versatile jewelry carrying case doesn't take up much room. Small enough to throw in any handbag, luggage and backpack when traveling. A DECENT GIFT: Portable size is ideal for daily use, travel, business. A perfect holiday gift idea for mom's, wives, girlfriends or sisters on Christmas, birthday, anniversary, Valentine's Day. If you have any questions about this product by Teamoy, contact us by completing and submitting the form below. If you are looking for a specif part number, please include it with your message.